I'm reviewing two wine by Ventisquero this week. 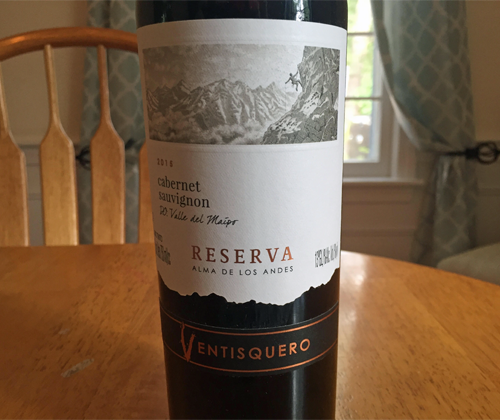 The first was the 2016 Reserva Sauvignon Blanc and the second is this 2015 Reserva Cabernet Sauvignon.In the past I've reviewed their 2013 "Grey" Glacier Carménère and their 2013 "Grey" Glacier Cabernet Sauvignon. The 2015 Reserva Cabernet Sauvignon is 85% Cabernet Sauvignon and 15% Syrah out of Maipo Valley, from granatic and stony soil. It saw a low-temperature maceration before fermentation, and then fermented in stainless steel tanks. After that, 70% was aged for ten months in French oak and then bottle aged for four months. It has a final ABV of 13% and can be shelved for up to seven years. 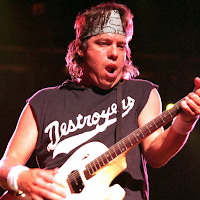 Sometimes you just need some good ol' rock n' roll, and it doesn't get more pure rock n' roll than George Thorogood and The Destroyers. So tonight for my music selection I'm listening some Lonesome George. I swear, I could listen to Who Do You Love? all day on a loop. I used to see this guy at the Melody Tent in Hyannis every summer and I'd love to see him again. He puts on a fun show and if the music doesn't make you want to go out and get arrested then there's something seriously wrong with you. Headphones are on, guitar is rippin', wine is ready to pour. So let's get down and dirty and drink some Chilean Cabernet! The color of the wine is ruby red. There's aromas of sweet tobacco, pencil shavings, black currant, blueberries and burnt sugar. On the palate it's medium bodied with a lush mouthfeel and soft tannin. It's super juicy with flavors of black currant, raspberries, blueberries, mocha, and a hint of black olives. Then it finishes with black currant, raspberries and cocoa powder. YUM. YUM. Oh hell yes. Even though this can legally be labelled as a Cabernet Sauvignon varietal, and they have labelled it as such, I'd prefer if they'd label it a Cabernet Sauvignon / Syrah because the Syrah is both very present and pleasant. Regardless, this is some delicious juice and I give it a recommendation!